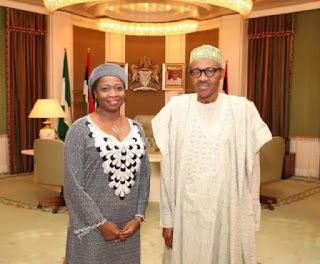 Details have emerged that Abike Dabiri, Senior Special Assistant to President Buhari on Diaspora impersonated a lawmaker in her recent interview with SkyNews, a British TV, by answering as the Nigeria's Chairman of Foreign Affairs Committee, a position currently held by Honorable Nnena Ukeje. Nnenna Ukeje is a PDP lawmaker representing Bende Federal Constituency, Abia and current Chairman House of Representatives Committee on Foreign Affairs. Dabiri had granted the interview which was to asses the impact of the Aug 29, 2018 visit by Theresa May, the British Prime Minister to Nigeria to deepend economic ties in light of her country's Brexit aspirations. Prominent Human Rights Attorney, SAGE L'eveilleur broke the infraction Wednesday morning in a tweet with a video of the interview and confirmed that the TV station has apologised to Nigerians on the matter. He said, "So ‘Haunty’ @abikedabiri impersonated Hon #NnenaUkeje on @SkyNews as she accepted being addressed as chair of foreign affairs committee when she is only an SSA to the President on Diaspora? What is she doing here when FG wants the UK out of Nigeria’s Business? Why SkyNews?! He continued, "Since @SkyNews No longer have a research unit let us school them a bit to save them from further embarrassments. There is nothing like DG Diaspora Commission. It only exists in the imaginations of of those living in a bubble." "To address her as chair of foreign affairs committee is to allude that she is a legislator in charge of a legislative committee which is blatantly false. I also wonder if this is their attempt to react to the U.S. Congressman." She is SA Diaspora to Nigeria’s outgoing President GMB who has overseen economic decline and the worst security breaches and job losses in the history of any democracy in the world." "Her Job has only been remarkable for her constantly being sent to repatriate the unprecedented high numbers of deported Nigerians, victims of desperately illegal economic migrants and occasionally to defend inanities and shift blames. This image laundry is painful to watch." "So @SkyNews note and apologize to Nigerians... @abikedabiri is NOT today a member of parliament or chair of foreign affairs committee. Addressing her as a Member of Parliament contradicts the fact on ground and thus is an outright falsehood."